2019.04.14 Sunspot 태양 흑점 2019.4.13. 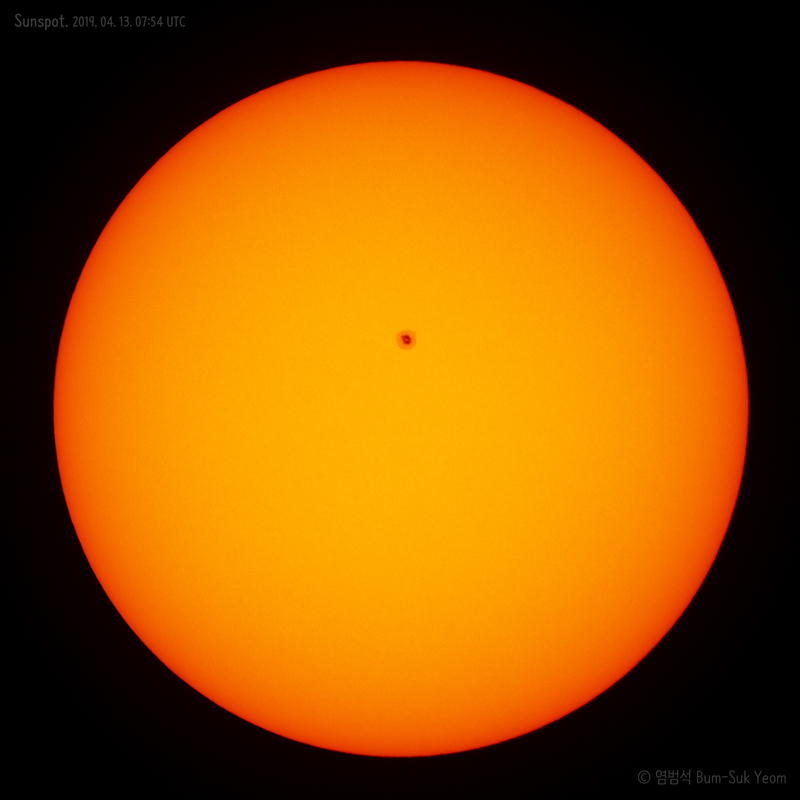 2019.03.22 Sunspot moving (movie). 2019.03.19. - 03.22. 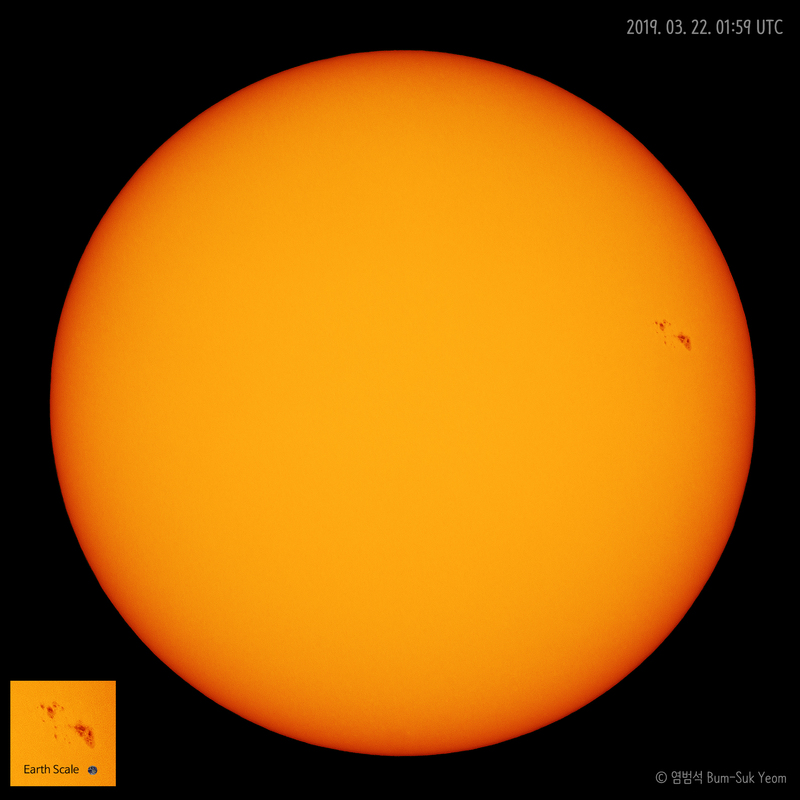 The appearance and disappearance of sunspot AR2738. 13 days. 태양 흑점 AR2738의 나타남과 사라짐. 13일간의 동영상. 2019. 04.07. - 04.20. 01:00 UTC. 2019. 04.07. - 04.20. 10:00 KST. Image credit: NASA/Solar Dynamics Observatory (SDO). 2019. 04. 13. 07:54 UTC (16:54 KST). Taken by Bum-Suk Yeom on April 13, 2019 UTC @ Iksan, South Korea. Details: 07:54 UTC (16:54 KST), Takahashi TOA-150 Apo refractor (f=1100mm, F7.3), Canon EOS M6 camera, Solar filter, ISO 200, f/7.3, 1/2000 sec x 4. 2019. 04. 13. 16:54 KST, 다카하시 토아-150 아포 굴절망원경 (f=1100mm, F7.3), 캐논 EOS M6 카메라, 태양 유리 필터, f/7.3, ISO 200, 노출시간 1/2000초 x 4, 전라북도 익산, 염범석. Copyright © Bum-Suk Yeom(염범석). All rights reserved. Goodbye! Sunspot AR2736 (movie). 6 day. 1024 x 1024 pixels. 2019. 03. 19. 10:00 - 03. 25. 10:00 UTC. 2019. 03. 19. 19:00 - 03. 25. 19:00 KST. Credit: Solar Dynamics Observatory (SDO), NASA. 2019. 03. 22. 01:59 UTC (10:59 KST). Taken by Bum-Suk Yeom on March 22, 2019 UTC @ Iksan, South Korea. Details: 01:59 UTC (10:59 KST), Takahashi TOA-150 Apo refractor (f=1100mm, F7.3), Canon EOS 5D Mark III camera, Solar filter, ISO 100, f/7, 1/1600 sec x 3. 2019. 03. 22. 10:59 KST, 다카하시 토아-150 아포 굴절망원경 (f=1100mm, F7.3), 캐논 5D M III 카메라, 태양 유리 필터, f/7.3, ISO 100, 노출시간 1/1600초 x 3, 전라북도 익산, 염범석. Copyright © 1994-2019 Bum-Suk Yeom(염범석). All rights reserved. Sunspot moving (movie). 2019.03.19. - 03.22. Sunspot moving (movie). 72 hour. 1024 x 1024 pixels. 2019. 03. 19. 10:00 - 03. 22. 10:00 UTC. https://youtu.be/GuT2wmVsFRo A movie from NASA's Solar Dynamics Observatory (SDO) shows the sunspot's rapid growth. 태양 흑점 움직임. 2019. 03. 19. 19:00 - 03. 22. 19:00 KST. 염범석. Bum-Suk Yeom. Credit: Solar Dynamics Observatory (SDO), NASA. New sunspot AR2706 is emerging over the sun's eastern limb. 태양의 동쪽 가장자리에 새로운 흑점이 나타났어요. 앞으로 2주 정도 관측이 가능할 것 같습니다. TOA-150B refractor + Galaxy Note 8 smartphone camera. The observation of the giant solar prominence (Movie). 2018. 03. 03. 거대한 태양 홍염의 관측(동영상). 2018. 03. 03. Coronado SolarMax II 90mm + Galaxy Note 8 smartphone camera. Movie: 2018-02-07 01:00 ~ 23:00 UTC. Image: 2018-02-07 10:30 UTC (19:30 KST). Movie: 2018-02-04 01:00 ~ 02-27 10:00 UTC. Coronado SolarMax II 90mm + Galaxy Tap S 10.5 inch Tablet PC camera. Taken by Bum-Suk Yeom on January 27, 2018 UTC @ Iksan, South Korea. Details: 06:27 UTC (15:27 KST), Coronado SolarMax II 90mm, Galaxy Tab S camera, ISO 40, f/2.4, 1/120 sec.